is considered to be 'from the wrong direction'. 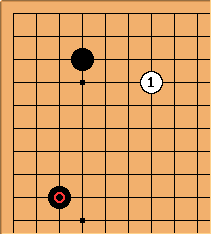 However, when a stone like is present, it is a common joseki move. Charles Matthews According to conventional ideas, the exchange / should be quite good enough for Black. 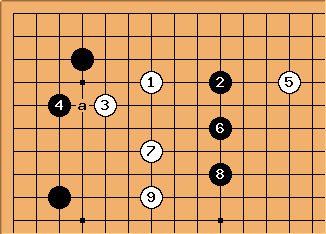 You can read about subsequent plays in this area at plays against low Chinese - follow-ups. 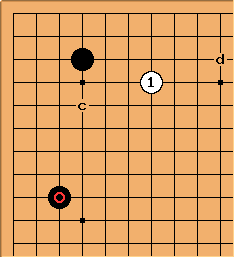 In the case of the theory of the Chinese opening, this conventional wisdom was been questioned and modified. That was recognised in the 1996 Japanese edition of Ishida. seems to be the oldest answer to . 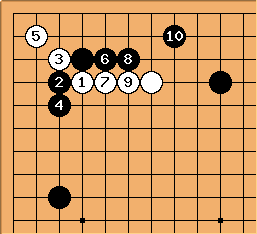 With , the joseki ends. 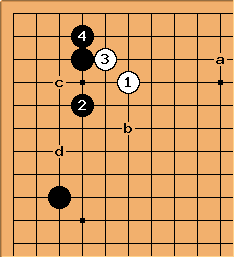 White can follow up with an invasion at a (answered at b), Black can strengthen his left-side framework with Black c-White d-Black e. But usually in this position, the next move has to do with some position nearing the corner from the right or the bottom. Nowadays, a pincer is more usual. There are two usual pincers. The first is the two-space pincer at . 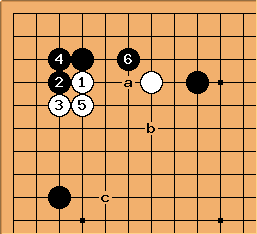 is a quiet answer, forcing (although Black might play at a instead, settling the shape more). Next White plays some kind of counterpincer, for example . 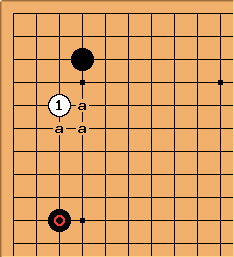 This diagram shows one possible continuation. is a second possibility. Black naturally tries to cut White with and , white fights this with and . 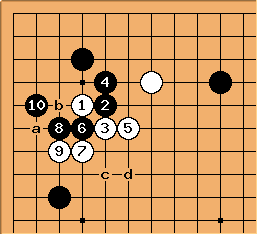 After Black 12, White defends at c or d, or plays tenuki. The third possibility is the attachment of , usually followed by the cut of . 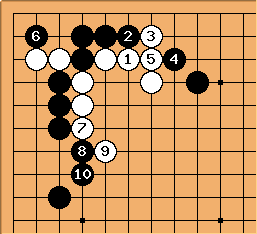 White attaches against the black stones to make shape for her own stones. I don't know whether there is any standard variation, but this one seems rather typical. A second possibility is , usually with the intention of creating a group in the corner. 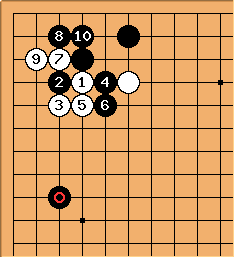 White gets a group in the corner, but her other group is weakened. After , the same answers are common as after the the two-space pincer. The keima has the same type of follow-up as before. After the ogeima at , the same variation follows again. Just as with the two-space pincer, this is the most common variation, but variations, especially at , are again possible. After the attachment of , there are two main variations. The first is similar to the one before. White again strengthens her group, giving up the corner. The hane of is a recent invention (the oldest game I found it in is from 1999). 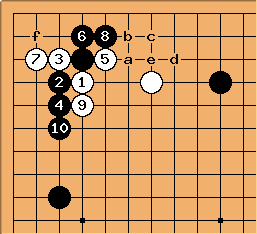 After , white continues with a, b or c.
iopq: From Cho Chikun - Yashimoto Yujiro in 1996 White continued at a. 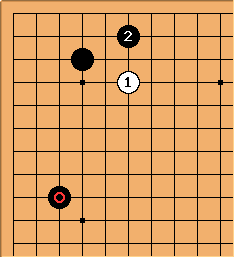 When the marked Black stone is at least this far away or is missing we have a basic 3-4 point where the most common follow up by White is an approach move either at or the other points a. 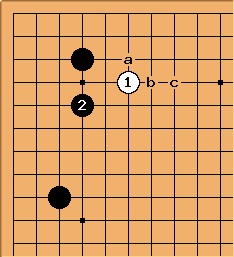 When the marked Black stone is at least this close or any of the other points b, we have an enclosure where White most often approaches only to the midpoint of the side around as a next step. Where the marked stone is exactly here we have what amounts to a special case. Most often this is part of the Chinese fuseki and the most common approach in current professional practice is . This situation came about through a lot of trial and error that has taught White that is more attractive at this point than either going all the way in to c or holding back to d.
Bill: Thanks, Dave! I have been puzzled by that wrong direction phrase. I supposed it reflected professional opinion or terminology, but maybe not. In any event, you are right that it is the wrong way to look at this position. I would go further and say that with any of these extensions we should properly talk about an uchikomi rather than a kakari. What about the close high approach? 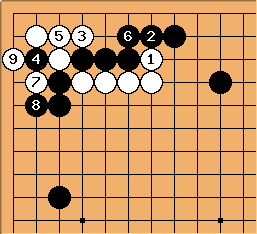 Here's an example from game between two 7 kyu players. As I look at this aferwards I feel I got very lucky with this attack, probably because my opponant had never seen it before either. 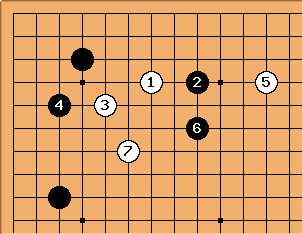 I don't say this is an example of good play, but after this game I came here to see if the close high approach move of at the 4-6 point was mentioned and see that it is not, just distant high approach of the 4-7. 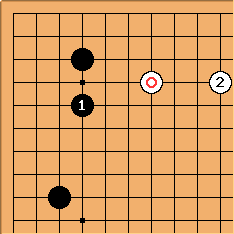 Does anyone know why the close high approach at the 4-6 point of is not mentioned? AndreEngels: I think the better answer for black would have been here. 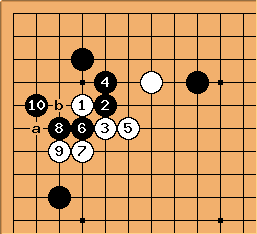 After this, is much more bothered by being in the sphere of influence of the black shimari than the more usual moves at a, b or c would be. Uberdude: Agreed is much better here than the 2nd line slide. 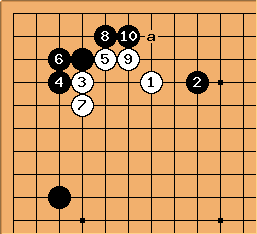 However I would add that this approach should not be dismissed as nonsense as it is sometimes played against the chinese opening. 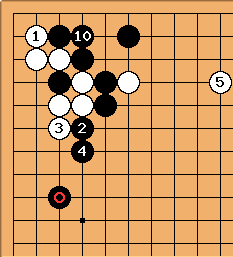 White exchanges for , and then either extends to a (this is common if it serves a double purpose as a pincer to a black approach move to a white stone at the upper right corner) or jumps to b if white is building a moyo. 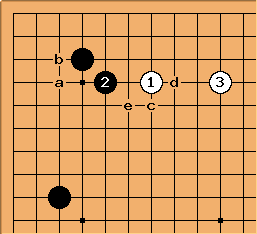 After the jump to b white is also aiming at an invasion with the aji of c and d. With the tight approach of black is locally doing better on territory, but white may choose this as part of a whole board strategy. 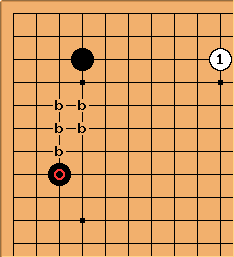 This shape appeared in a pro game MilanMilan vs BenHu on KGS (with the chinese opening) and demonstrates the various ideas I mentioned: white does get the jump to b and invasion at d. In the fighting that develops later black ignores a move on the corner and it becomes a ko. 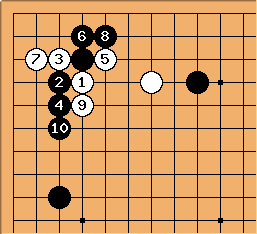 I noted that in the commentary smartrobot 9d (and 2p) said the initial approach is favoured by Wu Qingyuan aka Go Seigen.